Tag Archives: Just Energy Policies and Practices Action Toolkit. This webinar, offered on two different days, will introduce the National Association for the Advancement of Colored People’s newly released Just Energy Policies and Practices Action Toolkit. The webinar will explain the Toolkit, demonstrate the different parts of each action module within it, and highlight the NAACP’s energy justice projects around the country. For more information and to register, click here. This entry was posted in NewsBlog and tagged Just Energy Policies and Practices Action Toolkit., Just Energy Policies: Model Energy Policies Guide, National Association for the Advancement of Colored People (NAACP), Nebraskans for Solar NewsBlog on January 23, 2018 by Helen Deffenbacher. 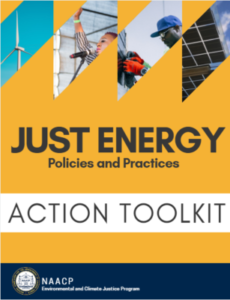 The National Association for the Advancement of Colored People (NAACP) has released the Just Energy Policies and Practices Action Toolkit. The toolkit contains modules to help guide individuals and communities move towards an energy economy that is sustainable, equitable, and just for all its members. It includes a section on how to pass net metering, distributed generation and community shared renewable energy policies, a fact sheet on advancing equity, inclusion, and leadership in the solar industry, and a fact sheet on solar consumer protection. The toolkit is designed to operate in conjunction with the NAACP’s Just Energy Policies: Model Energy Policies Guide, which contains specific information for people wanting to change policy. This entry was posted in NewsBlog and tagged Just Energy Policies and Practices Action Toolkit., Just Energy Policies: Model Energy Policies Guide, National Association for the Advancement of Colored People (NAACP) on December 22, 2017 by Helen Deffenbacher.